Panelists at the 229th meeting of the American Astronomical Society discussed geoengineering Earth's atmosphere to reduce the impact of climate change and the effect it might have on night-sky viewing and astronomy. Potential large-scale solutions to combat the influence that humans have on Earth's rising temperatures may directly affect astronomers. During one of the United States' largest astronomical conferences, on Jan. 4, scientists discussed what geoengineering the planet's atmosphere could mean for astronomers whose job it is to observe the night sky. Geoengineering refers to directly altering the Earth or its atmosphere to try and lessen the impact of climate change. While climate change is seemingly unrelated to night-sky observation, the panelists argued that it was an issue that astronomers needed to be concerned with. "We [humans] need to learn how to become a long-term stabilizing factor on this planet," Grinspoon said. To mitigate the most serious consequences of global warming, climate scientists have warned that the rise in Earth's temperature needs to be capped at no more than 3.6 degrees Fahrenheit (2 degrees Celsius). Long-term strategies require reducing the burning of fossil fuels, which puts carbon dioxide into the air. But the panelists said that won't be sufficient to reach the low levels necessary to meet the goals established by the Intergovernmental Panel on Climate Change (IPCC). "One of the dirty little secrets of the IPCC is that it requires negative emissions," Long said, referring to the process of recapturing CO2 that has already been released. No existing models predict staying below the necessary levels, she said, which means that it's not enough to simply stop emitting carbon dioxide; further steps will need to be taken to remove what's already in the air. 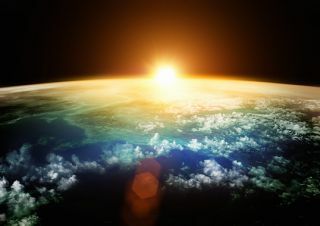 Geoengineering Earth's atmosphere includes several different proposals for removing carbon dioxide from the atmosphere. Various proposed methods can lock solid or liquid carbon into the ground, in trees or in water. "I like fizzy water, and I'm looking forward to seeing lots of CO2 in ground water," Ulmer joked. Geoengineering also includes methods for reducing the amount of sunlight. The panelists discussed releasing aerosol particles or spraying seawater into the atmosphere to form clouds, and launching mirrors into orbit to redirect sunlight. The planet's temperature depends on how much sunlight it receives, so changing that amount can keep the planet cooler. Changing the amount of sunlight is more readily deployable than removing carbon dioxide, Ackerman said. Synthetic volcanic clouds or clouds that hang over the ocean would reflect sunlight back into space, lowering the temperature. Geoengineering the atmosphere isn't something to be rushed into, however. According to Ackerman, there is no active research program in the United States or Europe that is studying the consequences of geoengineering. "Nobody wants to do this," Ackerman said. "No one wants to fund it." With no funding for trying to understand how any of the proposed methods could affect the atmosphere, those ideas are immediately dismissed from the realm of possibility. That needs to change if scientists plan to actively take steps to reduce carbon dioxide, the panelists said. "We can't go out and start this tomorrow, at least not in any responsible way," Ackerman said. He said that he firmly supports the need to do more research before deploying any systems to change the environment. That includes studying what kinds of unintended consequences could come from geoengineering. The panel members seemed certain that manipulating the climate on large scales could lead to problems on smaller scales: Changing the entire planet's climate could result in catastrophes at regional levels. "We can have a solution that works globally and gets the average temperature down to a safer range," Grinspoon said. It's possible, however, that such a solution could kick off a monsoon and cause a disaster for a lot of people, he said. The panel members agreed that geoengineering was only a short-term solution to help scale down the planet's temperature before it reaches catastrophic levels — it's not a long-term, permanent solution. "Solar-radiation management is not a substitute for mitigation," Long said. Adding particles into the air could have a number of important ramifications, including affecting how well astronomers can view the night sky. According to Lowenthal, some studies have shown that adding clouds to the atmosphere can increase the brightening of the night sky by as much as 25 percent. But that doesn't mean it shouldn't be done. "Fixing global warming is more important than astronomy," Grinspoon said. He expressed the hope that such a solution might inspire more astronomers to invest time in promoting climate change. Even without that impetus, he felt that the need to address the long-term consequences of global warming outweighed the potential benefits of studying the heavens. "There's no question to my mind that saving our civilization and many other species is more important than our ability to do ground-based astronomy for a few decades," Grinspoon said. Editor's note: This article was updated on Jan. 19 to correct the affiliation of Jane Long. She is a retired scientist at Lawrence Livermore National Laboratory and was not representing the Environmental Defense Fund during the panel.